The castle could be only entered at one point, the 'Porta', above which obtruded a square structure with an opening at the bottom part from which the inhabitants of the castle could pour burning oil on invaders. This structure no longer exists. Like all the other castles of Santorini, one can find a church close the entrance, in this instance, the church of Agia Theodosia. Below the castle there used to be a system of passageways, used for protection or even escape in times of need. 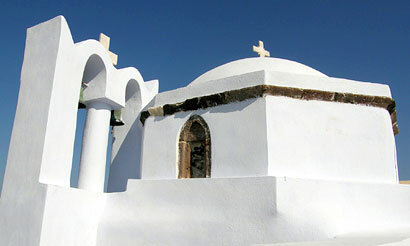 Within the castle walls, on the west side, one comes upon the church 'Theotokaki' or 'Koimisis of Theotokou' (Assumption), believed to have been built in the 10th century. Through the years, many additions have been made to the church. The church houses valuable icons and a wooden temple. The main icon of the Assumption was stolen in 1983. Also important is the Church of Eisodion of Theotokou, found at the highest point of the castle. It was built in 1660-1661, and on Easter Good Friday, the most important service of the Lamentations in Pyrgos is held there. In the surrounding areas of Kasteli a new town has been built, which in the past was called 'Exoporta' or 'Outside Door' by the locals. The square in front of the entrance of Kasteli was called 'Ypsilos Kafenes' or 'The Coffee Shop High Up', where the aristocrats used to gather. Nowadays the square houses a memorial plaque to those who fell in the Balkan and Greek Turkish wars of 1912 - 1921. The church of Agios Nikolaos can also be found in the square. 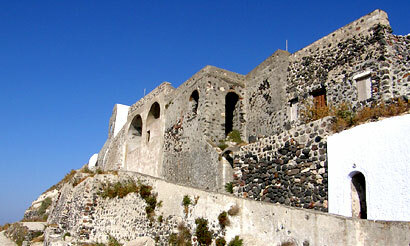 Pyrgos became the capital of Santorini after the abandonment of Skaros Castle in the mid 18th century, and before Fira, which is the capital of Santorini today.